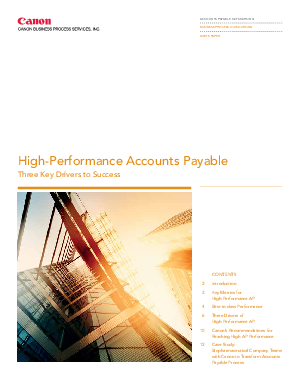 This whitepaper sponsored by Canon Business Process Services provides finance and business leaders with the performance indicators for becoming brutally efficient in the accounts payable function. We will examine the three drivers responsible for the efficiency and success in high performing AP departments. We also look at how the “best-in-class” AP functions differ from the average through six performance indicators. The six metrics you need to measure and benchmark to identify the improvement areas that will take you from an average performing AP department to a best-in-class performing department. How one biopharmaceutical company transformed its accounts payable process by adopting several best practices examined in the report – such as centralizing invoice receipt – to decrease backlog from 3,000 to 50 invoices and a 22 percent increase in on-time payments. Transforming an accounts payable department from a majority of paper invoices and manual processes to an automated high-performance one requires several steps that address process, labor and technology requirements. Get the latest data and learn how. Complete the form today to download this important industry survey.